The Legend of Zelda: Breath of the Wild is a big, brilliant game full of secrets to uncover. It’s a blast to explore on your own. But you might need a little nudging. UPDATE (3/15/17): Now that Breath of the Wild has been out for a couple of weeks, we’ve updated this post with some brand new tips. Because this is a game about discovery, and we don’t want to risk ruining that feeling for anyone, we’re dividing this tips article into two sections. First, some general tips that don’t spoil very much and will be helpful for everyone. Then, more specific stuff. 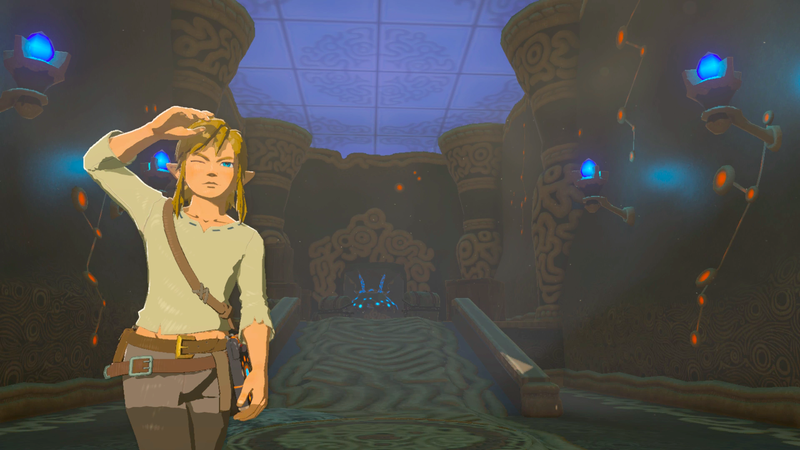 The mini-map and temperature gauge are both inessential, as Kirk points out, and it’s easier to appreciate Breath of the Wild’s beauty when there’s less stuff on your screen. Seriously, once you get used to playing this way, you won’t want to go back. It takes more stamina to jump upwards than it does to climb normally, so if you want to scale big walls, don’t jump. Find little ridges on the mountains where you can stop climbing and just stand still for a few seconds, recharging your stamina so you can climb even further up mountains without falling and dying. A good rule of thumb in Breath of the Wild is to explore from the top down. It’s easier to get your bearings—and find cool stuff—when you’re starting from a high point. Towers, as you’ll find out shortly after starting the game, are large structures that serve both as waypoints and as sources of information for your multi-tool Sheikah Slate. Until you find each region’s tower, your map will be totally blank. Climb to the top of that tower, however, and you’ll fill out that region of your map. Plus, you’ll have a new fast travel point and a good place to scope out where you want to go next. Each shrine is a fast travel point, so if you want to start exploring in one direction and then backtrack so you can check out what’s in the other direction, you’ll want as many of those as possible. Plus, they’re awesome. Once you’ve found a tower, zoom around your map and look for landmarks that seem interesting. They always are! The auto-save system is forgiving, but not THAT forgiving. Run into the wrong surprise boss and you may lose a few minutes of progress. As you’re exploring Breath of the Wild, you’ll inevitably encounter massive bosses and other dangerous surprises. This is, as I wrote in my review, a difficult game. Link might have the Triforce of Courage, but you don’t, and you’re the one who has to deal with the Game Over screen, so if you find yourself in a tricky situation, just nope on out of there. Townspeople have plenty of fun, useful things to say. The ones with red exclamation points near their names will give you sidequests, and many of the others will give you clues about what’s happening in each region. Some are just hilarious. Yes, it’s weird to have to worry about weapon durability in a Zelda game. Truth is, you don’t really have to worry. Breath of the Wild gives you more weapons than you know what to do with, so don’t be afraid to use your best ones. 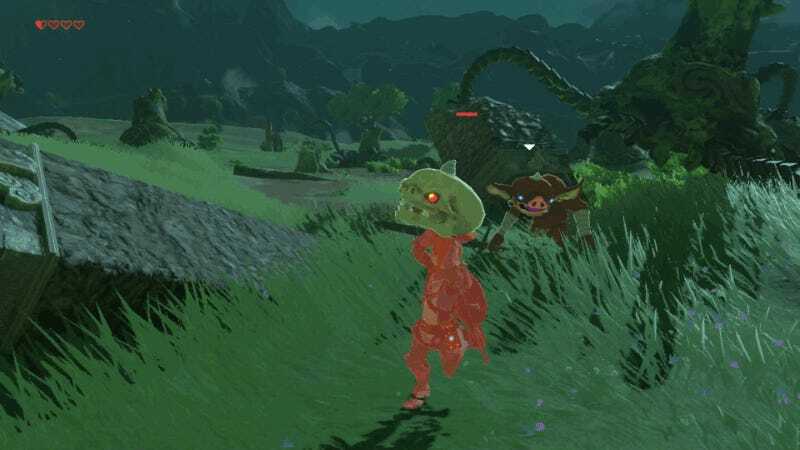 If your cool new sword breaks, you’ll find a replacement pretty quickly, even if you have to steal it from a Bokoblin’s dead hands. As you’re exploring, you’ll probably find places that you want to revisit for one reason or another. The in-game map lets you put down markers, but there’s no way to jot notes alongside these markers, so it’s easy to forget which things you want to come back to, and why. Keep a notebook (or laptop) as you play so you can write this stuff down. You can switch armor whenever you’d like. There are no penalties for doing this, no matter what situation you’re in. They’re cheap and essential. Also, if you shoot an arrow and miss your target, you can usually find that arrow lying on the ground nearby. You can’t remap buttons—get ready for lots of accidental crouching when you’re trying to run—but you can at least switch the jump button from X to B, which is way better placement. Each of these four weapons has a specific, useful purpose. The hammer will make it easier to break rocks; the blade will let you chop down trees; the torch is, well, a torch; and the Korok leaf will let you create wind. For really tough bosses, grab some radishes and cook them with raw meat for dishes that add extra hearts to your meter. Enhanced survivability! A handful of apples or mushrooms turns into a useful dish that can sell for good money and help you buy equipment (and other food ingredients) for your journeys through Hyrule. To maximize the amount of money you get, make sure you’re putting in five each time. You may want to hang onto the rare diamonds, but there are plenty of rubies, topazes, and amber rocks throughout the world. Don’t be afraid to sell a few so you can buy good gear. That’s where all those rare minerals come from. Find yourself freezing? Get some spicy peppers and throw them in a pot. Without getting too specific: There are four major towns, and after beating the main quest of each one, you’ll want to go back and talk to everyone for extra rewards and sidequests. He travels between towns and stables all across the world, and if you talk to him in each new place, he’ll give you big hints about where to find Link’s memories. He’s on the road to Kakariko Village. Help him out and then you can start looking for Korok seeds, which will let you upgrade your inventory slots. Bow and shield slots aren’t nearly as useful. Bricks, balls and chains, that sort of thing. Also, climb to the top of every mountain. Pick up every strange rock you’ll see. Korok seed mini-puzzles are everywhere. As the directors of Breath of the Wild describe it, this game is a chemistry set: part of the fun is seeing how you can manipulate the physics to solve puzzles and achieve your goals. Metal attracts electricity, wind propels objects, and everything catches on fire. You’ll be surprised by how many cool things are hidden in the depths of Hyrule’s lakes and rivers. Freeze an object, then hit it a bunch of times to send it flying in a certain direction, which can have some unexpected effects. You’ll need a lot of them to upgrade your armor. You’ll need them to upgrade your runes. They’re powerful and infinite, so they don’t waste your ammo or weapon durability. Plus, you can use them in all sorts of weird experiments. Not only can you catch faster, stronger horses throughout the game (the better ones tend to be toward the edges of the map), it’s fun to have a giant collection of horses. Put together sets like the Goron armor (helmet, chest, and pants) and you’ll get some damn good buffs. When you get it back, it’ll be nice and shiny. Not only can you discover good cooking tips in instruction manuals all across the globe, you can even find posters that offer good advice on what to cook. It’s tempting to climb mountains and skip over everything, but if you don’t follow the road to Kakariko Village, for example, you’ll miss out on some crucial equipment and landmarks. It’ll drain stamina but give you more time to aim. And it feels badass. Often, you can use them to find clever solutions to shrine puzzles. Sometimes a well-placed arrow can even let you bypass a shrine puzzle entirely. Remember this for A) defeating enemies during lightning storms; and B) solving puzzles that involve electrical currents. Just jump in the air and hit the button. There’s no real practical reason to do this, but it’s fun as hell. This is a good way to boost a horse’s affinity toward you. Just in case you don’t want to waste your radishes. Once you get the upgraded version, you can combine it with your photo compendium to keep track of all sorts of things. For example, take a picture of a treasure chest and then you can set the Sensor to beep when you’re near one. Since there are treasure chests everywhere, this can get a little out of hand, but it’s a fun little hack. Just equip a shield and use parry to send their beams right back at their big, dumb, mechanical faces. Use a bomb to knock them over. Often, it’ll have some sort of rare weapon or useful tool around its neck that you can steal without even fighting it. If you don’t have any heat-resistant gear or spicy peppers to cook, try lighting a torch for warmth or pulling out a fire rod/sword/spear. They all have special dialogue for Naked Link. When in doubt, try something crazy.